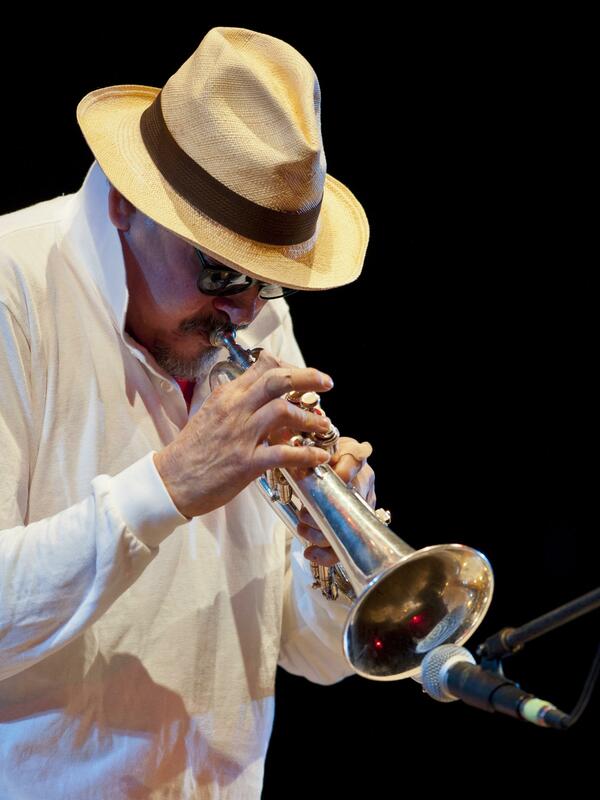 Jerry Gonzalez performs on November 17, 2010 in Madrid, Spain. Jerry González y el Comando de la Clave perform in Cali, Colombia on September 11, 2014. 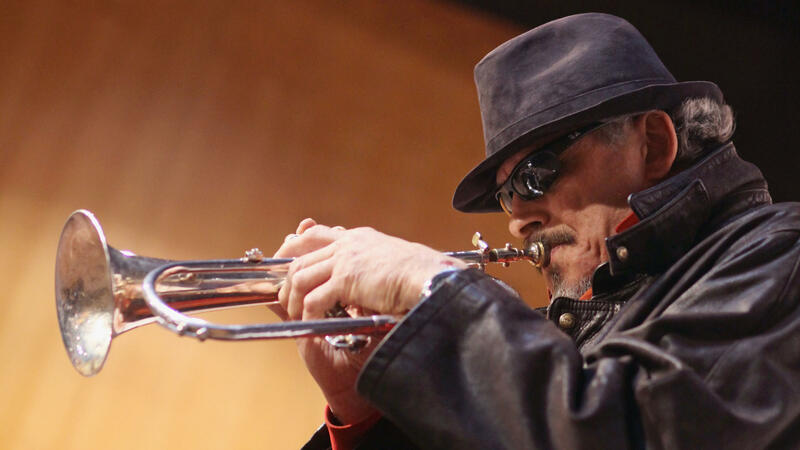 Jerry González, a percussionist and trumpeter who embodied the convergent spirit of modern Latin jazz, primarily as cofounder and leader of the Fort Apache Band, died Monday in Madrid, Spain. He was 69. González's death was confirmed by his record label, Sunnyside Records. The Fort Apache Band, which he formed and jointly led with his younger brother, bassist Andy González, put theory into practice with a visceral sort of polish. Ascendant throughout the 1980s and '90s, Fort Apache made its first two albums from European concert recordings in Berlin (The River is Deep) and Zurich (Obatalá). Already the group's balance of rhythmic fire and harmonic fluency was in place, though it would come to exert a greater influence. Rumba Para Monk was released in 1989; its meeting of Thelonious Monk compositions and Afro-Cuban rhythms earned widespread acclaim. His Fort Apache band would follow a similar playbook on subsequent releases, up to and including the 2005 album Rumba Buhaina: The Music of Art Blakey and The Jazz Messengers. Over the years, the Fort Apache Band featured a great number of inspired musicians hailing from both the Latin and jazz worlds. Along with drummer Steve Berrios, an anchor of the group until his death in 2013, that roll call has included pianists Larry Willis and Kenny Kirkland; saxophonists Joe Ford and John Stubblefield; and trombonists Steve Turre and Papo Vázquez. But the González brothers always provided the heartbeat of the band, with Jerry serving as front man, with his name and image out front. Gerald González was born in New York City on June 5, 1949, and grew up in the Edenwald Houses, the largest public housing development in the Bronx. His father, Jerry González, Sr., sang with an array of local Latin bands, and encouraged his son's interest in jazz. That interest bloomed as Jerry and Andy, a year and a half his junior, began playing around the city. They undertook a serious study of both jazz and Afro-Latin music, considering the two not in parallel so much as in endless dialogue. This was partly a reflection of their experience in New York, where they could go see everyone from Mongo Santamaría to Lee Morgan, John Coltrane to Machito. These were the extracurricular studies that bolstered their conservatory training at the High School of Music and Art in Manhattan. By the time they were students at the New York College of Music, the González brothers had also pursued an immersion in folkloric Afro-Cuban music, rooted more in ritual than commerce. As a conga player, Jerry focused on emulating the earthy rapture of a Cuban rumba group like Los Muñequitos de Matanzas. Inevitably, this area of study altered his relationship to jazz. "I listen to Trane, and I hear Muñequitos de Matanzas simultaneously in my head," he told Ted Panken in 2012, for JazzTimes. Referring to Fort Apache's take on a Monk tune, he added: "Our version of 'Evidence' is a combination of Frank Emilio and Muñequitos and Monk, together." Jerry and Andy González had an outlet for their cultural hybridism before Fort Apache, and while it was never as widely known, it has grown in stature over the years. This project, Grupo Folklórico y Experimental Nuevayorquino, released two albums: Concepts In Unity (1975) and Lo Dice Todo (1976). Perhaps best remembered for "Anabacoa," an irresistible guaguancó from the first of those albums, Grupo Folklórico featured accomplished players like the Cuban trumpeter Alfredo "Chocolate" Armenteros and the Puerto Rican percussionist Milton Cardona. While he expressed natural affinities with the music of Puerto Rico and Cuba, González also forged a deep connection with flamenco, especially after relocating to Madrid. He released a 2004 album with the sly title Jerry González Y Los Piratas Del Flamenco, featuring the elegant acoustic guitarist Niño Josele and, as a special guest, the magnetic gypsy singer Diego el Cigala. Later he formed a touring group called Jerry González y el Comando de la Clave, releasing an album by that name. Though based in Madrid, the ensemble prominently featured a pair of Cuban musicians, pianist Javier Massó "Caramelo" and bassist Alain Pérez. It also set a place at the table for El Cigala, with a repertory that included jazz standards as well as originals. Concert footage of the band shows the degree of its cultural synthesis — and the extent to which González holds it all together. When González left the United States, the Fort Apache Band went on a hiatus that was occasionally mistaken for an ending. The group embarked every now and again on a well-received reunion, including a handful of engagements at the Blue Note in New York. In 2011, Arturo O'Farrill and the Afro Latin Jazz Orchestra presented a concert at Symphony Space titled "Andy & Jerry's: A Tribute to the González Brothers." O'Farrill, a pianist and composer, remembered Jerry González on Facebook this morning as "a guide to all of us and a direct inspiration in my musical awakening"
He added: "Jerry has joined the company and memory of those whose presence on this planet changed the conversation about an art form and forced every musician, critic and journalist to acknowledge our people and the contributions we make."